US President Donald Trump yesterday demanded that online retailers do more to crack down on the sale of counterfort products by third-party vendors. 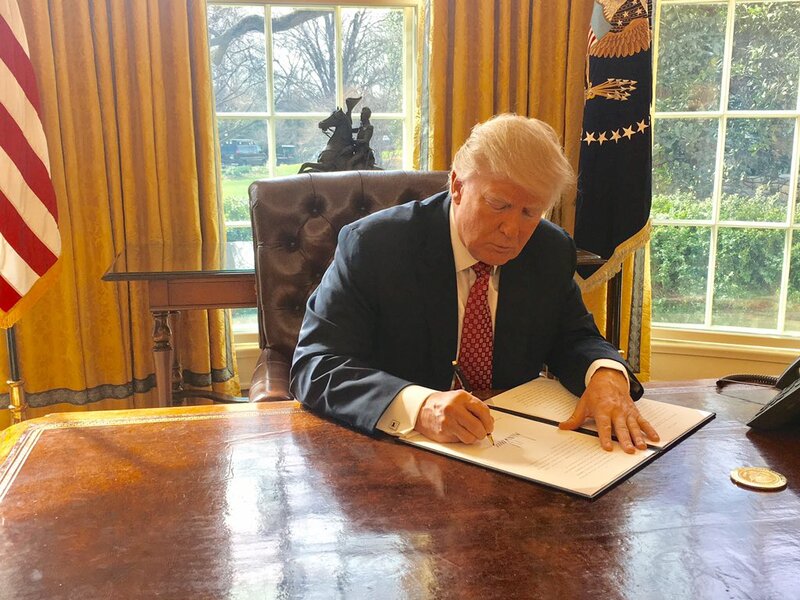 Signing a memorandum on combating trafficking in counterfeit and pirated goods, Trump called for a coordinated response to the problem from government, law enforcement agencies and the private sector, as well as third-party sellers themselves. Noting that intellectual property infringement and the sale of counterfeit products harms rights holders, cheats consumers and damages the reputation of online marketplaces, the memo states that the value of the global trade in counterfeit and pirated goods could rise to $500 billion a year, with some 20% of this trade affecting US rights holders. The memo states that the prevention of the manufacture, importation and sale of counterfeit and pirated goods is now a priority for federal law enforcement agencies, and that US government efforts to halt the online sale of such items will be “expanded and enhanced to better address the scale, scope, and consequences of counterfeit and pirated goods trafficking”. Trump has also called for more information to be gathered on what more the US government can do to stop the sale of counterfeit and pirated goods online, asking in the memo for a report that can help lawmakers “develop a deeper understanding of the extent to which online third-party marketplaces and other third party intermediaries are used to facilitate the importation and sale of counterfeit and pirated goods”. Speaking with reporters after the signing of the document, Director of the White House National Trade Council Peter Navarro said it was intended to target “trafficking through third-party online marketplaces [such as] Alibaba, Amazon and eBay”. “This is a warning shot across the bow that it is your job to police these matters, and if you won’t clean it up the government will,” he said. Trump’s intervention comes just weeks after a joint report from the Organisation for Economic Co-operation and Development (OECD) and the EU’s Intellectual Property Office revealed that pirated and counterfeit goods now account for 3.3% of all global trade. The two organisations estimate that the global value of counterfeit and pirated goods was $509 billion in 2016, the latest year for which records were available, up from $461 billion in 2013, which amounted to 2.5% of all world trade at the time. According to the report, American companies were most affected by the illicit trade in pirated and counterfeit items in 2016, with US products accounting for 24% of global seizures.